I was pleased to note a familiar old name being bandied around in Hibs circles yesterday. The name Cropley will be familiar to many Hibs aficionados and also not a few older generation Aston Villa and Arsenal supporters as belonging to the brilliant talent of 1970s’ midfielder Alex Cropley. Alex was one of my great Hibs heroes. In what was a wonderful and creative team shrewdly managed by Hibs boss, Eddie Turnbull in that era, midfielder Cropley shone, even amongst a great array of talent and flair. Alex Cropley’s game was very much a multi-dimensional one. Not only could he play inch-perfect and flamboyant cross field passes and hold the ball with sublime skill, he could also ‘dig’ pretty well too. His tackling being at the sharp and aggressive end of the spectrum belying his size and neat, deft ball skills. Alex was quite left-footed but what a foot it was. Alex was born in Aldershot, England being the son of a serviceman stationed in that part of the world. This fact provided his long-time nickname ‘Sodjer’ although he did come to represent Scotland internationally on two occasions. One might look back at the modest two caps and ask how many more times that would have been had he played for Celtic or Rangers instead of Hibs? Nevertheless Alex did have a good career before ending his playing days prematurely at just thirty-one. In 1974 after a successful period at Hibs he was transferred to Arsenal where he unfortunately failed to establish himself due to continual injury problems, unluckily suffering two leg-breaks. 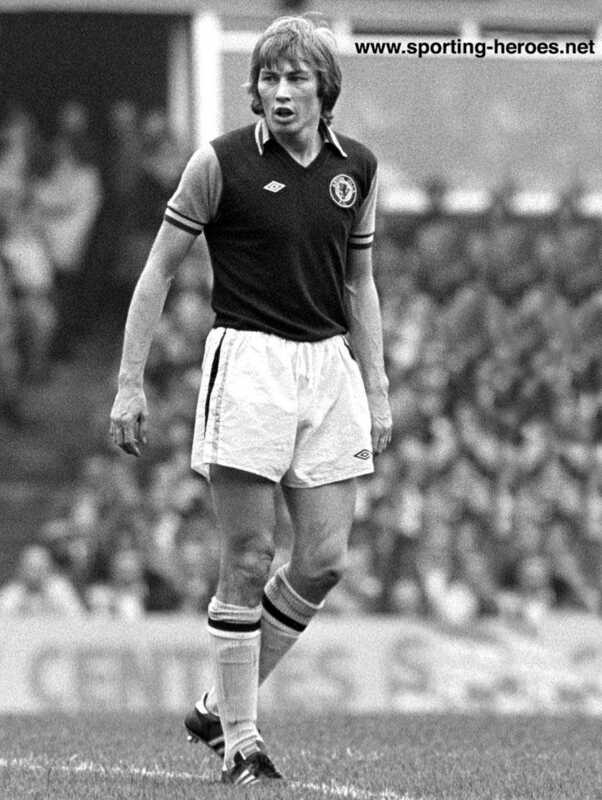 In 1976 he moved to Aston Villa where he made sixty-seven appearances before leaving in 1980. Alex continued playing for a short while with Newcastle, Toronto Blizzards and Portsmouth before finally drawing the curtain on his playing career. The mercurial former midfielder now earns a living as a taxi driver in Edinburgh. It’s 1974 and Alex Cropley signs for Arsenal under the eye of Gunners boss, Bertie Mee. Now it seems the name of Cropley returns and I for one an excited at that prospect. Alex’ son, Jordan Cropley is also a midfield player who is currently on the verge of breaking through from Hibs’ junior ranks. Newspaper reports tell us that Cropley jnr. travelled to Sweden with the Hibs first team squad for the recent Inter-Toto tie. Perhaps the most shocked to hear of this prospect was Jordan himself and its good to hear of his obvious humility and that his feet are firmly on the ground. Apparently Jordan Cropley is left-footed and passes the ball extremely well – just like his father did all those years ago. He feels himself to be not quite as aggressive in the tackle as his dad was however. It seems churlish to state that if Jordan develops into half the player his father was he will be a fine performer indeed. I hope that he is allowed to further his career without the millstone of comparisons with his famous father being made too often. Was in his taxi in Edinburgh this summer. What a great bloke! I’ll bet he could tell a few good stories, Steve!